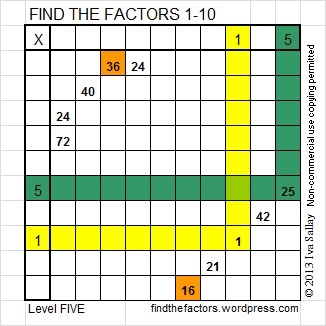 FIND THE FACTORS is a logic puzzle based on the multiplication table. 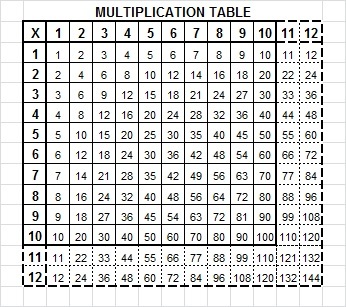 In this table, the numbers 1 – 12 in the top row and first column are factors of the products listed on the inside of the table. 3. Next look for a row or a column with at least 2 clues so that you can find a factor for both clues. 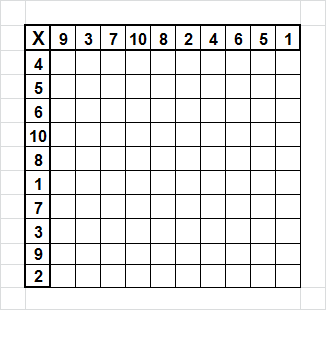 This puzzle has one column and one row that qualify. However, the clues, 36 & 24, are not helpful yet because 2 different numbers (4 and 6) will factor into both 36 & 24. On the other hand, the column containing 24 and 72 is very useful because 8 × 3 = 24 and 8 × 9 = 72, and all of those factors are not greater than 10. Since 8 is the ONLY common factor meeting that condition, write 8 above that column and write 3 and 9 in the corresponding cells. 4. 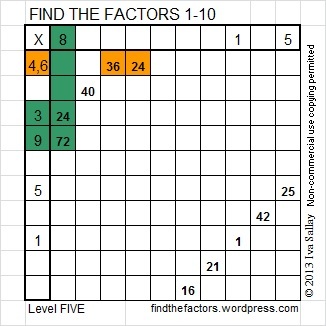 Since you have found the 3 in the factor column, try to find the 3 in the factor row. Because the only way to factor 21 is 3 × 7, that has to be where the other 3 belongs. Likewise, since 42 = 7 × 6, you know where to write its factors. Write the 3, 7, 7, and 6 in the corresponding cells. 5. Remember when we noticed that both 4 and 6 were factors of both 36 and 24? 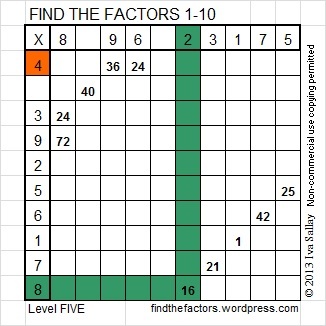 Finding that 6 in the factor column for the previous step means that 6 cannot also be the factor of the clue pair 36 & 24. 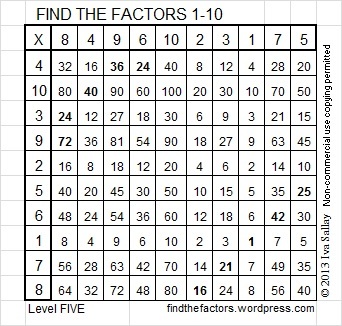 Therefore, you have found where the 4 should be written in the factor column. Write 4, 9, & 6 in their corresponding factor cells. 2 × 20 = 40, but you can’t write 20 in the factor row. 2 × 8 = 16, but there’s already an 8 in the factor row. The only place in the factor column that the 2 can be written is in the cell next to the row with no clues. 7. 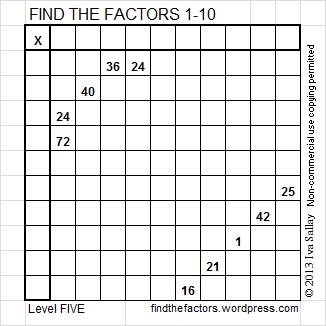 The factors of 16 are 4 × 4 and 2 × 8. 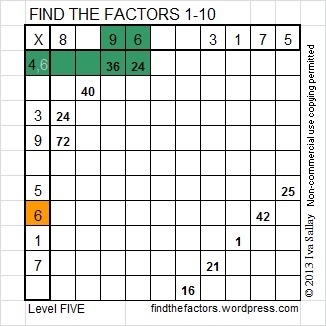 Since 4 already appears in either the factor row or the factor column, 4 × 4 cannot be the factors of 16 needed here. 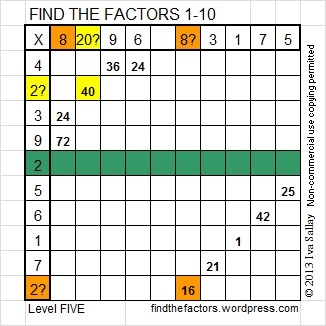 Write 2 in the factor row and 8 in the factor column. 8. 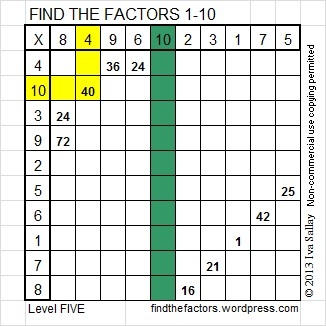 The only number 1 – 10 missing in the factor column is 10. Since 10 × 4 = 40, write 10 & 4 in the cells. 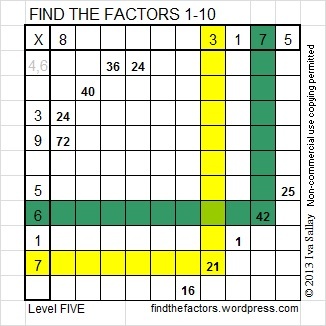 Now count from 1 to 10 while you determine what number is missing in the factor row. In this case the missing number is 10. 9. Now all the factors have been found! At this point I don’t always fill in the rest of the table, but when I do, I can complete a 10 x 10 table in less than 3 minutes and a 12 x 12 table in less than 5. It would benefit any child to see an adult filling in a table just for the fun of it. What a powerful example of lifelong learning would be set! All of the steps listed above can be summarized in a single chart. Okay, that was easier to understand that I thought it would be. It’s 6:30pm, my husband is busy clearing off snow from the driveway, the puppy has found a comfy nook, and I am going to try my hand at puzzle 321.
to use some images from your blog. Many thanks. Thank you for your interest. I’m assuming you would like to use just a few of my images. If the image has findthefactors.com on it, you may use it. For any other images, you can probably use them, but I will decide on a case by case basis and you would have to state they are from findthefactor.com. Good luck on your new blog!